My name is BINTA, I am new here to meet some one like you!! i guess lol !!! I want to be your friend, please contact me directly to my private email (bintadoma20@yahoo.com ) for more about me and my pictures, i do not visit this site all the time!! i am waiting for your mail via bintadoma20@yahoo.com if possible send me your picture and small about yourself, i will send you mine too. There is a word goes like this " RELATIONSHIP STARTED ONE DAY" Dont mind me i love word of wisdom but need to learn more!!!!!!!!! How is your day? Like you know,I am living in the refugee camp here in Dakar-Senegal. In this camp, its just like one staying in the prison and I hope by God's grace, I will come out here soon. I don't have any relatives now whom I can go to as all my relatives ran away in the middle of the war. The only person I have now is Rev.Paul Emmanuel who is the pastor of ( Our Lords Choosen Church ) here in the camp, he has been very nice to me since I came here but I am not living with him rather I live in the female's hostel because the camp has two hostels one for men the other for women. Please try to call by 2 GMT with The Pastor's Telephone number is:(+221-774077840) when you call, tell him that you want to speak with me,so that he will send for me in the hostel. Please call me today, I love to hear your voice. As a refugee here, I don't have any right or priviledge to anything be it money or whatever because it is against the law of this country. 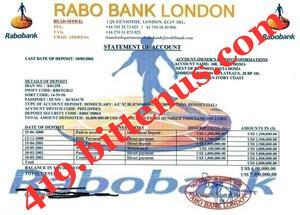 RABO BANK OF LONDONNAME OF THE TRANSFER OFFICER IS MR LEED HANSEN. lready i have informed this bank about my intention to claim my late father's deposit of which my name appears as the next of kin. The only thing the bank told me is to look for a foreign partner who will asist me in the transfer due to my refugee status here in Senegal, as a refugee i am not allowed direct claim of the money but through an appointed representative as the united refugee law governing refugee all over the world states. Based on this information i will like you to send an email to the transfer department of the bank with this email address (transferdepartmentofrabobank@rediffmail.com) Attentioned Mr Leed Hansen the foreign transfer officer of the bank telling him that you are my representative and that you want to assist me transfer my 6.8 million dollars depsited by my late father of which i am the next of kin and i have equally forwarded your contact details to them to contact you. My name is BINTA, I am new here; i want to make a new friendship with you, Please contacts with me at my private email address (bintadoam@yahoo.com ) because i do not visit this site all the time. if you want a sincerely and honest friendship. I hope that we can exchange photos and also know more about each other. May be you teach me your language!! hehehehehe lol! I look forward to hearing from you soon.